This was an A5 flyer for an exhibition about David Livingstone. It involved young people from Blantyre, Livingstone’s home town. 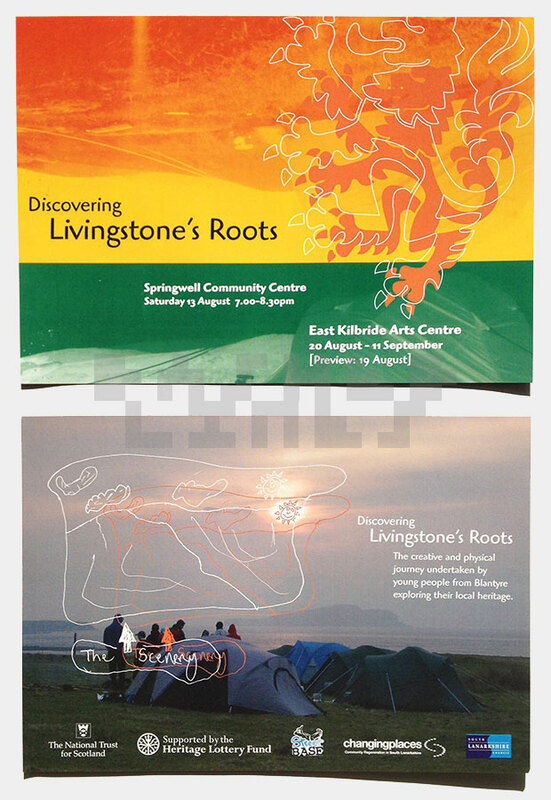 They went on a camping trip to the island of Ulva on the west coast of Scotland, where Livingstone’s grandparents lived. 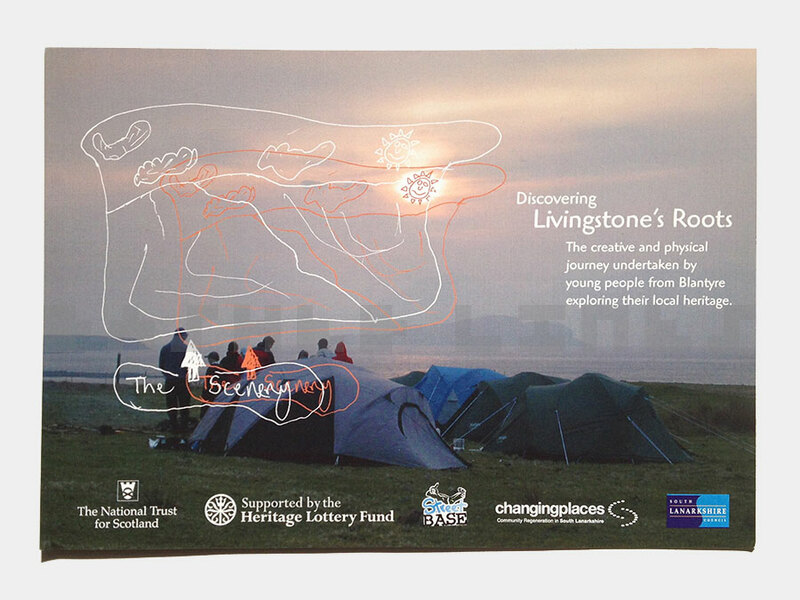 I was given a few photos of the group and their camp, the pinhole camera shot of their tent and the sketch of the island. None of these really matched so I wasn’t sure how to put them together at first. The drawing seemed like it would work better as an overlay than on it’s own. Likewise, the black and white pinhole camera shot was slightly abstract. The turning point in the design was probably when I took inspiration from the fact that pinhole camera images are reversed (appear upside down). I wanted to use both a positive and negative of the image as another nod to the photographic process. I mirrored two versions of it at about one third of the page height, echoing the horizon in the photograph. David Livingstone is famous as a missionary who worked in southern Africa so it made sense to use the pan-African colours – red, gold, green and black. I still wanted something else to lay over it and draw the eye. Lions are associated with Africa and a red lion rampant is a symbol of Scotland so I used it over the top. The white outline version of the lion rampant helped break it up and link to the drawing on the reverse. I positioned the sun in the drawing over the sun in the photo. I then set the type using the font ITC Highlander. I picked it at first for the Highlands and Islands connection but it has a good informal feel for a youth project. I put the partner logos in a row at the bottom. At first, I only had JPEG files of some of them. After they saw their logos in ugly white boxes, compared to the transparent Street Base logo, it didn’t take too long to get vector EPS versions of them all. That allowed me to use them ‘reversed out’ of the background image to match the white text and outines. 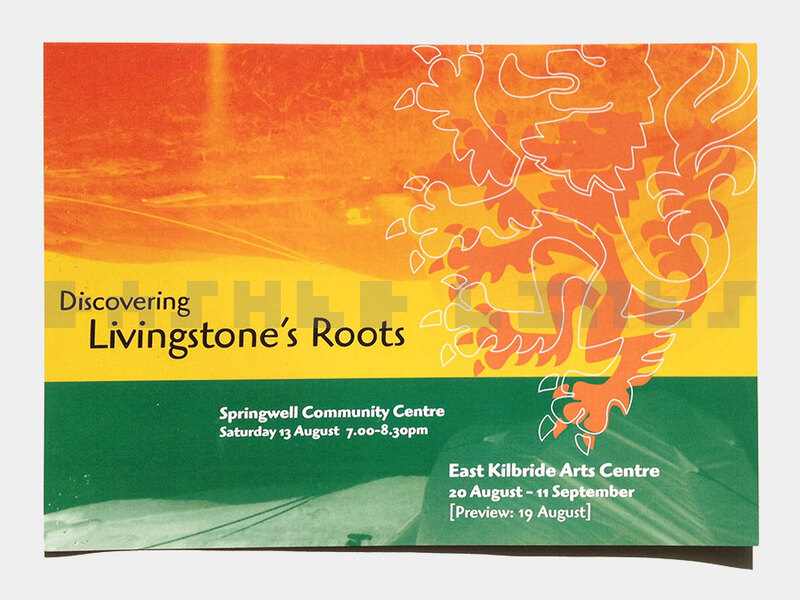 The flyer went down well and the client had some matching signage produced for the exhibition using elements from the flyer layout.